Twice a week we went to the yeast shop near Castle Circus Torquay. We bought the yeast to make up for the B vitamins which we missed for not eating meat. We used to eat it with a spoon of soft brown sugar and loved it. We had Bircher Benner Swiss Muesli for breakfast, not like the packet stuff today. Grated apple, pears, bananas or other fruit freshly put on top with almonds, peanuts, cashew or coconut with the creamy top of the fresh Devon milk. We had no fridge so cream cheese was made with the sour milk. During the war we got our meat/bacon ration in extra cheese. During the war to ensure the vitamin C in childrens diets the government provided welfare orange, rosehip syrup and blackcurrant puree available at clinics. Welfare orange was a concentrate in a flat sided bottle with a turquoise label, Rosehip was a delicious syrup in a clear bottle . children collected the rose hips from the hedgerows and brought them to school, The blackcurrant puree was like a sharp smoothie I think in a tin. My children loved the welfare orange.. apart from the rose hip they were low in sugar. It was available at chemists too. I was in bed and was awoken by the air raid sirens. It was a dark cold nght with a clear sky. My father and mother took sister Heather and me into the Anderson Shelter outside in the back garden. The shelter was dug into the earth and covered over by earth. It was damp and cold with condensation running down the walls so everything felt damp. We had candles and a parafin oil lamp. There were two bunks . We were too excited to sleep and we heard the noise of the Nazi planes faint at first but then overpowering, they seemed to fly very low, the bangs of antiaircraft guns the hiss of schrapnel and the loom of the searchlights. The first bombs were in the distance then the clunk of incendiaries and much later the explosions of land mines. To me as a young child it was a massive fire works display . I went to sleep and was woken by tremendous bangs and the earth shaking, several houses in the road behind were hit and fell down opposite in our road two houses were destroyed. All our windows and doors were blown out. The electricity failed. After the all clear we found that the gas was cut off and there was no water. My father drove the car to the front of the house we piled as much as possible into our BSA coupe and set off to Pembroke in West Wales. A journey of two hundred miles which normaly took at least twelve hours to drive. On the road just outside Carmarthen we broke down my father knocked up a rural garage and asked if he could use their workshop. Together they mended the car. While they were working we were taken into the kitchen and given bacon and eggs, unheard of in war time food rationing. A roaring fire great excitement to be awake in the middle of the night. We arrived in Pembroke in the early morning to start a new life with the extended families with no father.He drove back to Coventry to his work as an Admiralty Ordinance Overseer ,West Midlands working all hours driving all over the country. Life with two extended families was different staying with various relatives but mainly at 39 Main Street, Campbells Garage with all the bustle and coming and going of a thriving business. He had a hectic war involved in all sorts of government procurement . 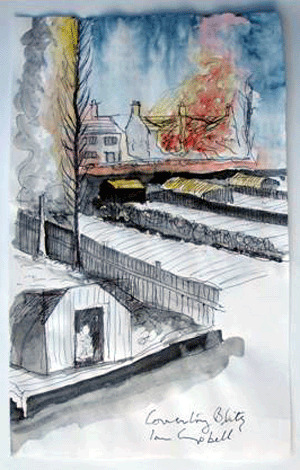 Soon after the Oil tanks at Pembroke Dock were bombed and set on fire to burn for several weeks. My uncle Ronald my fathers youngest brother was in the Auxilliary Fire Brigade and became a local hero. Pembroke was not the rural sanctuary it was a naval dockyard a sea plane base a submarine base and covered in airfiields for the aircraft that covered the Wester Approaches and later the North Atlantic. At that time both Erica and myself have memories even though we were only 2 and 6 years old at the time. Erica can remember being taken to the bottom of the road and seeing Coventry in flames. She also remembers the devestation of the City and the profusion of Rose Bay Willow Herb that was prolific growing within the ruins,even today she will not tolerate this plant in the garden. I lived the other side of the city between Rugby and Coventry and being a boy found it all very exciting with the flashes and bangs of the exploding bombs. We also collected loads of shrapnel and spent bullet and shells. Erica's father noticed that in a lot of the houses that had been bombed the stair cases were still intact so he had a Morrisons Shelter, which was a very heavy metal table surrounded by a mesh,in which they could shelter put under the staircase (bogey hole) for protection. With regard to safety we had an Anderson Shelter in the garden but it was very dark and miserable. I can also remember my Grandmother putting me into the bottom drawer of a chest to protect me in the case of a bomb landing nearby as they were jettisoned by the German planes to lighten their load on their way home. Surrounding the village where I lived there was a searchlight station, an anti aircraft base and also several barrage balloons which always reminded me as a child of "elephants"and I can still recall the Pom Pom of the guns and the bright streaks of light from the search lights as they tried to pinpoint the planes for the gunners. we did not get at home. with corundum paste, made of wood driven by overhead belting. grinding and welding hell on earth. was carried out to drill very small holes for gaseous diffiusion plants. materials and controlled crystal sizes. concerned that they were to be destroyed by the Thatcher government. up in a large house in rural wales. printing studio in the seventies. stamp on gun breech blocks and barrels. were shipped by train in parts to the shipbuilding yards. were sent there for testing. test samples in a controlled way as they were stretched and fractured. measuring it on the Brinel Scale. They developed the largest dynamometers to measure power out put . When she left school she went to work in T.P.Hughes department store in Tenby. She worked in the Record Department. She lodged in the end cottage of Quarry Cottages with Mr and Mrs Pedwell. She married Colin Garratt Campbell the oldest son of William Horatio Campbell of Campbell's Garage 39, Main Street Pembroke.They were Married in the chapel at Carew. They moved to Gillingham in Kent and eventually to Coventry.They were bombed out in the Blitz of Coventry and returned to Pembroke with their children Ian and Heather..The children went to Eastgate School. William Horatio Campbell (Ian's grandfather) was the oldest Home Guard in Pembroke Borough and District during the War. He shot down a German plane that flew low over Pembroke after bombing the docks. He had a gun taken from a fishing trawler in a field along side St Daniels Church on the hill on the south side of Pembroke...The army had their properly built gun emplacements past the graveyard further west. They are still there. Many from the town rushed up to see the plane. The German pilots were too scared to get out but were eventually taken away probably to do farm work with other prisoners of war. Ian remembers climbing and sitting in the cockpit.There was another plane crash nearby of a Polish crew who ran out of fuel. They were injured and taken into the nearby farm on the day the farmer's son was born. Ian was born in Gillingham. His grandfather was in Pembroke. The family had a garage in the main Street, taxis,petrol sold with a pump over the pavement. They used to charge up all the batteries for the locals beforemains electric came to Pembroke. Harry Bird's three sons fought in the second world war. One remained a strict vegetarian and must have had the best diet in the whole of the armed forces. Special food parcels were flown in and dropped at his camps when he was serving in Africa. The other two had to live on the scraps and stale bread rations like the rest of the battalion. When they were demobbed Harry rented a house for them in Daison Heights with wonderful wooden panelling, it wasn't in the family long as Maidencombe House was soon purchased. A daughter was posted to Bristol to work in a factory they were working in a cave underground and the water used to drip down her neck from the roof. She contracted rheumatic fever and was sent home to Adyar to convalesce, she just lay in a darkened attic room and was at home for six moths, then they called for her again, Harry didn't think she should be called up but they were so desparate for workers. He insisted she went somewhere more healthy and they arranged for her to go to Bath, just under the cliffs where they had a factory making valves the size of light bulbs, she stayed there until the end of the war, then went for a while to live with Norman in Daison Heights as she was homeless after Harry had sold Adyar without telling her. John Healey served in the Royal Navy he came from a long line of Naval personnel. Sadly the Healey family do not wish to paticipate in the site so we have no details. Newton Bird would have been the third Joseph Newton. He was killed in action in WW2 over Holland when the bomber he was in was shot down by a German night fighter. Harley Bird was in the Royal Navy during WW2. He saw action initially in the naval battles against the Germans in the South Atlantic off Argentina and Uruguay. See Graf Spee German pocket battleship on the internet 1939. After that he was promoted and sent to officer training school in England. During that time, he spent some time with a relative who had a farm in the Somerset area. There are some photos somewhere. I assume that this could have been a sibling of Nettie's. Apparently they were very good to him. The Protestant Cemetery at Oudewater contains the graves of seven British & Commonwealth Graves. On the night of 9-10 April 1943, a Lancaster III Bomber, ED502 WS-V (nicknamed Barbara Mary) of No 9 Squadron, took off at 2048 hrs from RAF Waddington in Lincolnshire, England. 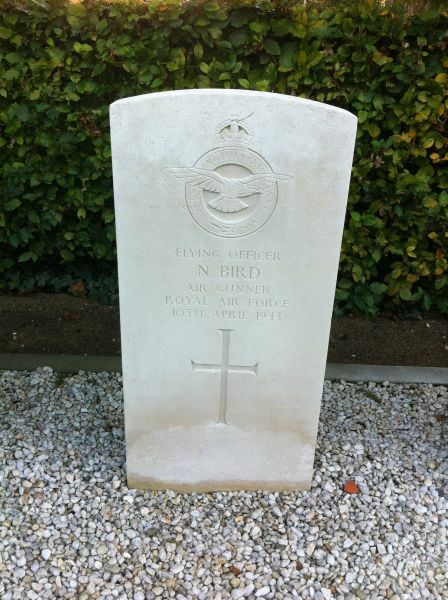 It was shot down on the way home by Hptm Hans-Dieter Frank of 2./NJG 1 (his 21st victory) based at Venlo. It crashed at 2345 hrs at Snelrewaard (Utrecht) 3 km north east of Oudewater, Holland. These men were taking part in the Duisburg raid of 9/10 April 1943, on which 5 Mosquitos and 104 Lancasters were dispatched, but thick cloud again caused a scattered attack. 8 Lancasters were lost in total during this operation. Warrant Officer Arthur White, 23 years old from Wiakato in New Zealand. Pilot. Sergeant William Barker, 32 years old from Cromer, Norfolk. Wireless Operator/Air Gunner. Flying Officer Hector Robertson, 25 years old from Aberdeen, Scotland. Navigator. Sergeant William Jakeway, 19 years old from Barnet in Hents. Air Gunner. Sergeant Norman Tutt, 22 years old from Ashford in Kent. Flight Engineer. Flying Officer Graham Gibbins, 20 years old from Salisbury in Southern Rhodesia. Bomb Aimer. Flying Officer Newton Bird, age unknown from Camps Bay in South Africa. Tail Gunner. The names of the airmen buried here are also engraved on a small Dutch memorial erected on the opposite side of the road. Hans-Dieter Frank (8 July 1919  28 September 1943) was a German Luftwaffe night fighter ace and recipient of the Knight's Cross of the Iron Cross with Oak Leaves during World War II. Frank claimed 55 aerial victories. The Knight's Cross of the Iron Cross and its higher grade Oak Leaves was awarded to recognise extreme battlefield bravery or successful military leadership. Frank was killed in a mid-air collision with another night fighter northwest of Celle in the night of 28/29 September 1943 This collision was likely caused by an attack made on his fighter by RAF night fighter ace Bob Braham. it was often planned in his changing rooms at the shop with the local councillors/ criminals sharing it all with him thinking he would approve of the land deals the backhanders, the town silver stored by an alderman and sold off during the war for personal gain. Wish I could remember in detail the struggles he had with corrupt bosses in the aircraft industry during the war.he said he was prosecuted during the war as a Communist trouble maker. There must be court records in Bristol and Trowbridge. Dudley took us round Plymouth to see all the new council houses built by the city after the war. He was full of civic pride as the city treasurer. Gertrude was quite ungracious saying they could have been less regimented and more imaginative. The war started when I was two and finished when I was seven. I remember walking to Tor Abbey Sands from our first small house 'Little Ideen' at the start of Teignmouth Road with the big green and cream coach built pram with everything in it, either under the rexine mattress base or in the tray between the large wheels. Later with baby Susan in the pram and me a toddler sitting in the edge on a central rexine board. I remember walking up the hill under trees past small gardens after going past the gates with swan statues. We had no car during the war. Then all the beaches were covered with rolls of barbed wire. One bombing raid I remember clearly was when a German plane flew around the tall chimneys of Belmont House which was below little Ideen. I remember the young pilots face and his leather helmet. Later I found out he went off low over the beach and the barbed wire defences and shot a man ,a local education officer who lay on top of his son on the sands. Later still I learned the pilot was shot down. was training as a graphic designer, he was very caring having been brought up with his two brothers by his widowed mother. During an air raid in Torquay in January 1943 Lilian Childs gave birth to Julia under the bed!! The candlestick that Gertie took into the bomb shelter and some shells and a grenade that Ian was given when he went round the factories with his father towards the end of the war.He said they were so heavy in his pockets that he had a job to keep his trousers up! Japan invaded China on July 7, 1937. This invasion began the second Sino- Japanese War. Julius Rothermel (John Watson) was posted to Grantham for the duration of the war to run the Chemists shop in the High Street. Even during the war years Ellen John and Janice managed to travel to Devon to see the family. Likewise Harry and Dorothy went to Lincolnshire, either to Grantham or Butlins Holiday Camps to spend time with their daughter and family. Also Norman visited in 1939. After sixty years we are gradually finding each other through this website !!! Stories in the family were told that Barbara Lena Rothermel/Butler came to Devon in the late 30's. She was penniless and homeless, Harry Bird put her up in one of the rooms in Esdaile during the war years where most of the family stayed on and off and some grandchildren were born there. I was only very small when the war broke out but I recall bombs dropping and the sirens and I do remember a time before shelters were given out. This particular day the sirens went off around tea time, so it was still daylight. My granma Lizzie and Grandy lived accross the road from our house and when the sirens sounded, it was their practice to open their front door and we all ran across the road (neighbours included) the men were in the Forces of course. Ir was a sight to behold this particular day, everyone went straight into the front bedroom and dived under the bed ) It was a special one made for Grandy because of the shrapnel in his legs as he couldn't bend his knees) It was also reinforced. So under everyone went but on this day the neighbours had visitors so there were more of us than usual. So only head and shoulders were under the bed and all the bottoms were up in the air. A photo of that scene would have made Hitler smile !